A world-famous artist as well as accomplished composer, Mark Kostabi is nearly synonymous with the New York art scene. Having made his debut in 1982, Kostabi soon became a leading figure of the wild and heady East Village art scene - surrounded by the likes of Andy Warhol, Jean Michel Basquiat, and others. As a master of crisp, bold, surrealistic graphic-style images, Kostabi is an artist's artist: one of his many side projects is a "game show" he hosts in which fellow artists and art critics compete to name his new art pieces. Another is "Ask Mark Kostabi," an advice column he publishes for artists. 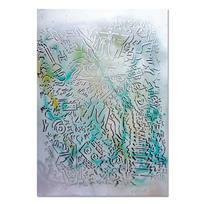 His work is also collected by an impressive array of rock stars, opera singers and other luminaries. Among many other notable commissions, Kostabi did the artwork for Guns n' Roses "Use Your Illusion" and the Ramones' "Adios Amigos" albums. Recently, Kostabi was recognized by Pope Benedict XVI who officially blessed his bronze statue of Pope John Paul II at its inauguration in Rome. An always-prolific and dynamic artist as well as public figure, Kostabi divides his time between New York and Rome. 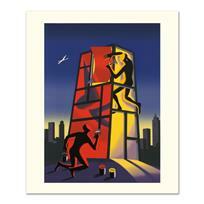 Mark Kostabi, "Windows Of Opportunity" Limited Edition Serigraph, Numbered and Hand Signed with Certificate. 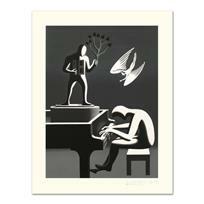 Mark Kostabi, "I Did It Steinway" Limited Edition Serigraph, Numbered and Hand Signed with Certificate. 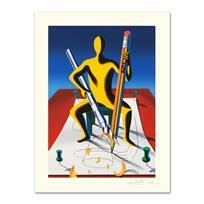 Mark Kostabi, "Careful With That Ax, Eugene" Limited Edition Serigraph, Numbered and Hand Signed with Certificate. 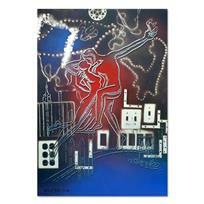 Mark Kostabi, "Cyclone Variations" Limited Edition Serigraph, Numbered and Hand Signed with Certificate. 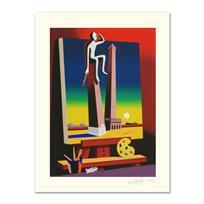 Mark Kostabi, "Above The World" Limited Edition Serigraph, Numbered and Hand Signed with Certificate. 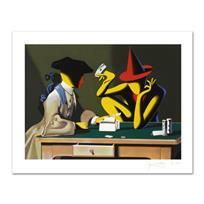 Mark Kostabi, "Chance Encounter" Limited Edition Serigraph, Numbered and Hand Signed with Certificate. Mark Kostabi, "Progress Of Beauty" Limited Edition Serigraph, Numbered and Hand Signed with Certificate. 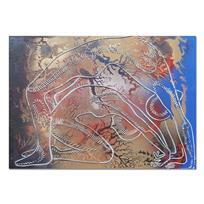 Mark Kostabi, "Panic In The Minefield" Limited Edition Serigraph, Numbered and Hand Signed with Certificate. 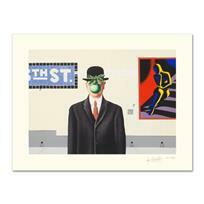 Mark Kostabi, "Yesterday's Here" Limited Edition Serigraph, Numbered and Hand Signed with Certificate. 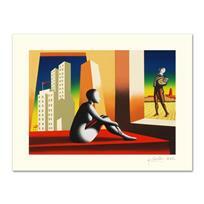 Mark Kostabi, "Loophole With A View" Limited Edition Serigraph, Numbered and Hand Signed with Certificate. 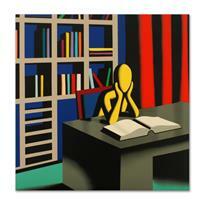 Mark Kostabi, "Useless Knowledge" Limited Edition Serigraph, Numbered and Hand Signed with Certificate. 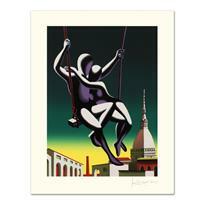 Mark Kostabi, "Going Places" Limited Edition Serigraph, Numbered and Hand Signed with Certificate. 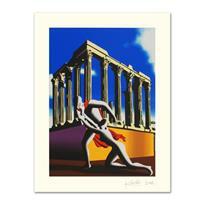 Mark Kostabi, "Eternal City" Limited Edition Serigraph, Numbered and Hand Signed with Certificate. 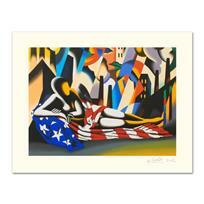 Mark Kostabi, "America" Limited Edition Serigraph, Numbered and Hand Signed with Certificate. 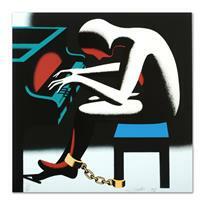 Mark Kostabi - "Beyond Forever" Limited Edition Serigraph, Numbered and Hand Signed with Certificate of Authenticity. Mark Kostabi, "Atmospheric Reverie" Mixed Media Original Painting; Hand Signed, with COA. Mark Kostabi, "Awakening Frozen Passion" Mixed Media Original Painting; Hand Signed, with COA. Mark Kostabi, "Awareness In The Mist" Mixed Media Original Painting; Hand Signed, with COA. Mark Kostabi, "Beyond Borders" Mixed Media Original Painting; Hand Signed, with COA. Mark Kostabi, "Big Time Dreams" Mixed Media Original Painting; Hand Signed, with COA.